Have you ever wondered what it would be like to retire early and travel the world? Well, today you are in luck as we interviewed a couple doing just that! “We are not rich. We are not powerful. In fact, we don’t even consider ourselves to be “smart cookies”. Instead, we saved. We downsized. We sold both of our homes and moved into an Airstream that we’ve named Charlie. Early retirement is possible”. 1) Tell our readers a little about yourself, your blog, and your early retirement? 2) Walk me through the step-by-step process that you went through to get to where you are today. What was the first thing you did? Next? 3) If a recent graduate walked up to asking for your advice and you only had a few minutes to give ‘em your best tip, what would it be? 4) At what point in your life did you get the “wake up” call, that working 9-5 until social security kicked in was not for you? 5) What changes in your life did you have to make in order to start saving so aggressively to have an early retirement? 6) How did you decide to live out of an air stream? Why not an RV? How much different is your life living on the road? 7) Do you plan on continuing to “work” digitally through your retirement for extra income? Does your blog or any social media following currently make you any substantial money? 8) I’m sure some people are wondering about your net worth. How did you know for sure that you could retire with less than the “golden standard” of 1 million in the bank? What calculations did you have to do? 9) On your website, it stated your investments are actually still growing although you are retired and pulling money out of them. Can you explain in detail more about your investments? 10) Have your efforts in downsizing affected your happiness? 11) Tell our readers something interesting about yourself. Do you have any kids? What are your passions? What drives you? How do you stay motivated? 12) How do you handle health insurance as an early retiree? 13) We are motivated by your early retirement story, it’s truly remarkable! Help us motivate or readers. In a few sentences, what does early retirement mean to you? Make sure you follow us on Pinterest! I’m 35 and my wife is 32 and we both quit our jobs to pursue a life of full-time travel. The blog was designed to chronicle our journey and will continue to do so as much as possible. We both retired from relatively high-paying jobs in information technology, and those salaries definitely had a significant impact on our ability to save. We saved around 70% of our salaries, and that adds up very quickly. The first step was to decide what we are retiring to. The retiring “from” part was easy, but without something to retire TO, you’re setting yourself up for extreme boredom. A lack of purpose. For us, it was to travel our nation and document it as much as I can. We do that through our blogs (ThinkSaveRetire.com and FullTimeExplorers.com) as well as our YouTube channel at A Streamin’ Life. The next steps were actually fairly simple – stop spending money. We cut out anything from our lifestyle that wasn’t critical, but we weren’t savages about it. We still went out to eat, but only a couple times a month rather than a couple times a week. The more that we cut from our lifestyle, the easier it became to cut even more. It’s amazing how little most of us actually *NEED* to survive…and be happy. I’d ask him or her a question: Do you plan on working in a fluorescent hell hole until you’re 65? Does that sound pleasant? If not, don’t live like your friends. Prioritize your future. Save your hard-earned cash because you never know when that flow of money will stop, and that’s the cash you’ll be living off of…perhaps in only a few years! It was soon after I entered the working world about 12 years ago, actually. I just didn’t do anything about it until a few years ago, which happened to coincide with marrying my wife. We decided to combine finances and focus entirely on saving as much as possible so we can quit work and enjoy our lives. Simple changes. We cut out those things we didn’t feel were critical. No magazine subscriptions. No cable television. No yearly cell phone upgrades. We paid attention to the things that we bought and asked ourselves if buying such-‘n-such item was worth working longer in order to pay for it. Nearly 10 times out of 10, it wasn’t worth it. We wanted to retire MORE than we wanted the stuff. The cars. The big house. I don’t plan on holding a full-time job, either in-office or remote, for the rest of my life. That said, I am involved in a couple side projects that I can do online, but that’s only because I happen to enjoy them. The second I stop enjoying them will also be the second that I stopped contributing my time. We have planned our lifestyle so we never need to depend on any additional income. Of course, anything extra is just icing on the cake. I do make some money with my blog and other projects, but nothing even close to substantial. We’d be lucky if we pull in $10,000 a year at this point. But, that’s okay. $10k a year actually funds a third of our lifestyle. You can check out our How to Start a Part-Time Money Making Blog if you’re interested. We’ve used a slew of calculators that use something akin to the 4% rule. FireSim, cFireSim and the Personal Capital Retirement Planner are a few examples. All calculators put us in the high 90s, which is more than enough for us to pull the plug. While a million bucks would be nice – I suppose – we believe it’s a completely arbitrary number. We are flexible people and are willing to make the necessary adjustments to ensure our lifestyle continues to hum along in a way that makes us both happy. We keep things super simple. We have a targeted retirement plan with Vanguard that we keep the majority of our money in. We don’t invest in individual stocks. We let Vanguard diversify our money, letting their track record speak for itself. It’s worked well for us thus far. Fees are very manageable: Vanguard Fees. We pay normal income tax on any income that we receive, but we aren’t actually selling off our investments yet. We have about three years of living expenses in an Ally savings account, so that’s the account that we’re currently living on. Withdrawals from Ally are, of course, 100% tax-free. We will begin using the Roth conversion ladder once we deplete our Ally savings, which will allow us to take out our contributions from our Roth accounts that were contributed five or more years ago – penalty free. Start tracking your investments and net worth absolutely free with Personal Capital. Yes, very much so. The less we have, the happier we seem to be. I think we’ve all heard the phrase “Mo money, Mo Problems”. In many ways, it’s true. We like to keep our lives very simple. Needing to buy, maintain and store fewer things makes a huge difference in our ability to sit back and enjoy life. We don’t miss a single thing that we cut out of our lifestyle. I still love going out to eat, though – but we do that very sparingly. We have no kids and plan to keep it that way. No kids had a huge impact in keeping our costs low and retiring as early as we have possible. I am a fitness fanatic and love the movie, Erin Brockovich. 🙂 Photography is my biggest hobby, and that now includes videography as well with our YouTube channel. I stay motivated by recognizing how nice we have it. The last thing I want is to be forced back into holding a full-time job. We are members of Liberty Health Share, actually, that is exempt from the healthcare mandate but still provides health coverage. We are treated like cash-paying folks. Here’s an article I wrote back in March about our switch to Liberty. Early retirement is the freedom to choose what to do with your time before you hit 65. The freedom to make your own schedule. Pure freedom! ABSOLUTELY! Love learning from those further in life than us. It’s an amazing story and we are so glad you were willing to share. Thanks again! Love watching your youtube channel. Long term making videos is something we really want to do. What software do you use to edit? We currently use Final Cut Pro. “a fluorescent hell hole” – haha! That is so very true! In fact, I stood on my desk a few months ago and loosened the 4 fluorescent bulbs over my head so I could have a less sterile office space. It’s the little things! Thanks for sharing your story in a succinct interview like this. I have always enjoyed your blog and following along on your adventures. I still need to check out that YouTube channel. Congrats on early retirement again! I retired early and it was totally the right decision. The plan included an Airstream like the one you have. I hope you have a good cushion because the Airstream was nothing but trouble. Leaks in windows, leaks from the water heater and many little things. The first one was so bad that Airstream replaced it with a 2014 model. Sad to say..,it was worse! It put a huge hole in out retirement cushion and many trips to Ohio to get it fixed. Finally, they took back the 2014 too. I hope you have a better experience. Sounds like you got off to a rough start! Hopefully Steve from Think Save Retire can answer your question. We interviewed him. #6 Why not an RV??????? 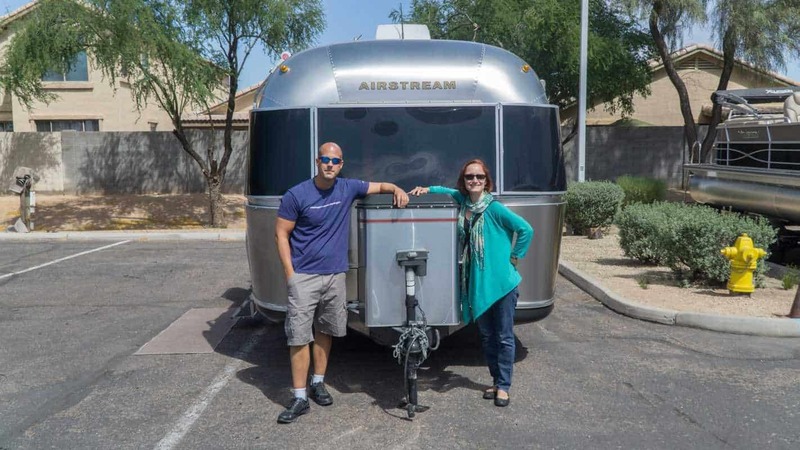 An Airstream IS AN RV…..
We know that now after interviewing ? Hey Kay! That’s a great question. Hopefully, Steve comes back to answer. Can’t wait to do more of these. Yea that’s a tough one. I think that’s one of the main struggles of early retirement.